Drinking in Israel involves saying ‘I’Chaim’ or ‘To life!’ many times. Occasionally, it also involves raising your glass and saying, ‘Phachem’. This is the name of an excellent hand-crafted stout ale or imperial porter made in a tiny garage in the Judean Hills. Frank Zappa was right. You can’t be a real country unless you have a beer and an airline. 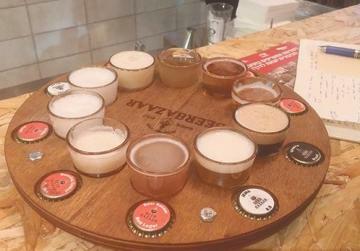 And with El Al now serving a blonde called Alexander on its flights, Israel is up to speed. 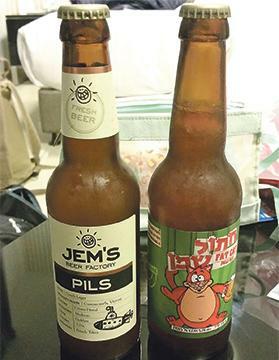 Beer culture has been slowly but surely fermenting in Israel and it’s not all about Gold Star and Macabbi. 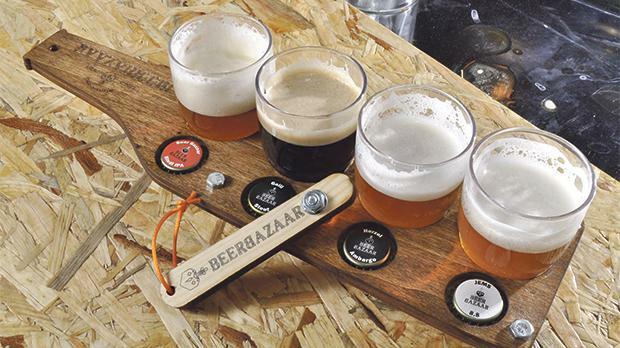 The new Beer Bazaar in Jerusalem’s Machane Yehuda Market serves over 79 handcrafted beers by bottle and on tap, including a Red Eye Special. Made from nitro-cold coffee and hand-crafted stout, it’s the perfect lunchtime pick-me up for those who are recovering from a big night out. 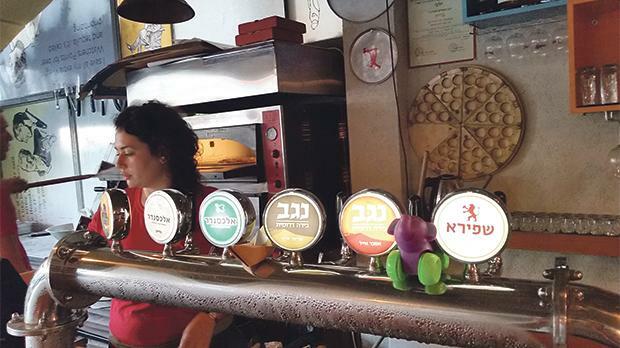 Tel Aviv’s Dancing Camel is another place that is famous for its selection of artisanal ‘Sukkot in a glass’ beers and like many it experiments with fruits of the land producing a Cherry Vanilla Bud and Leche del Diablo chilli ale. 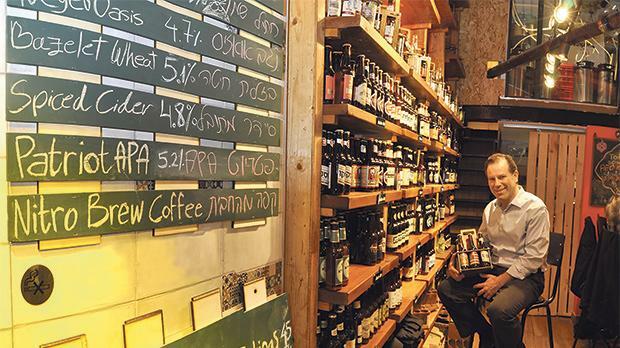 Former biologist David Shire runs the Lone Tree Brewery, 10 miles south of Jerusalem in the Gush Etzion forest. His brewery is named after the Etz Haboded oak tree that stood through the Jordanian presence from 1949 and 1967. A tour costs 20 shekels (€4.9). A 330ml bottle of homebrew 15 shekels (€3.7). Degustations take place in the tasting room in the Abu-Cleb Recreational Park. “I grew up in the west end of Glasgow. I studied Cell biology at Glasgow University,” said Shire, swilling appreciatively. In the distance was the coastline from Tel Aviv to Ashdod and Ashkelon. On a good day you can see Jerusalem. In 2009 Oatmeal Stout, IPA and English Northern Ale (like Newkie Broon) followed. “We also brew seasonal beer for the Jewish New Year with Pomegranate and Date Syrup.” But wine tourism is the latest trend in the Holy Land. Over one million bottles of Israeli wine are consumed in the UK every year. KendomEurope is the biggest importer and distributor. 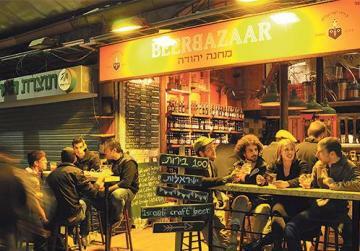 Israelis drink as much wine as Argentinians. In Israel, wine tourism is popular. There are 300 wineries. Many of the kibbutzes offer accommodation. At Eshtaol, in the Judean Hills between the Kisalon River and Kdoshim Forest, Golan Fla introduces you to his Noble which he describes as “a wine with an Israeli heart and a noble soul”. The winery is open on Fridays. North of Haifa, the Itzhaki family’s business in Kfar Tikva (Village of Hope) offers White Tulip and Black Tulip, working closely within a local community set up to care for people with special needs. Former Israeli TV photographer Yoram Shalom’s Alexander Winery in Hefer Valley offers Rose Roger, a Cleopatra and an Alexander The Great cabernet sauvignon. Swill some red and white Tabor Pearls and Kedesh Valley reds in the tasting room at the foot of Mount Tabor and join in one of the winery’s summertime family harvest days. You pick and crush your own grapes. Then toast your efforts with a flute of 562 sparkling, commemorating the height of the famous peak 11 miles west of Lake Kinneret (Sea of Galilee). The Visitors’ Centre is open Sunday to Thursday. Don’t miss the Viognier, Gewurztraminer or Roussane – a Rhone Valley varietal grown in the Golan Heights. One of the country’s highest vineyards,Galil Mountain at Kibbutz Yiron, near the Lebanese border has six vineyards and 15 blends and varietals and will tempt you with a full-bodied, well-rounded Barbera. Its flagship wine is Avivum – a Viognier and Chardonnay blend named after the moshav (agricultural settlement) on the Blue Line. If you need a garage en route you can have a drink in one. Filmmaker-turned-independent winemaker Ze’ev Dunie makes Chenin Blanc and Zinfandel in his garage at Seahorses in Bar-Giora in the Jerusalem Mountains. Many kibbutzes make wine from banana and kumquat. Perhaps the best range of fruit wines comes from the Morad Winery run by the Morad and Bodner families in Yokneam at the foot of Mount Carmel. You can choose between Danue date, apricot, coconut, grapefruit, cinnamon and carob wines. Amiad Kibbutz offers Hills of Galilee wines. You can raft down the Jordan River and visit Rosh Pinna, Safed and Capernaum, as well as the Hamat Gader hot springs, Hula Valley, Yehuda forest and Mount Meron. The kibbutz makes honey wine as well as a kumquat aperitif wine. And even blackberry wine. It also has an organic toy factory. Carmel, south of Haifa, is the largest winery in Israel. The country’s first Prime Minister David Ben-Gurion and his successor Levi Eshkol worked in its cellars. The oldest is Zion, which was originally founded in 1848 in Jerusalem. Its west wall formed part of the Wailing Wall. It is now in Mishur Adumim, 10 minutes from Jerusalem in the West Bank. Not to be outdone, the Negev has a Wine Route. Sde Boker in the Moshav Ramat Negev tamarish produces Malbec from the Wilderness of Zin. Its degustation centre is next to Dave Ben-Gurion’s Desert home. Yatir Winery at Tel Arad is on the site of a 3,000-year-old Canaanite city. Its premier wine is Forest Red. The winery is in Israel’s largest forest. Deuteronomy 33:28 describes Israel as “a land of grain and new wine”. Every year, Israel stages a Kosher Wine Expo. In August, Tel Aviv and Jerusalem both stage beer festivals and the Israel Wine Show which takes place in the garden of the Israel Museum. They are worth attending. But maybe not on the same day.